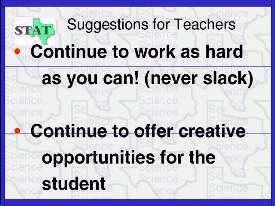 Well, suggestions for us teachers relate to our work ethic, and since we have a strong work ethic, we should never give up, in spite of the numerous obstacles we face. The consequences of never giving up mean that we will continue to offer our students opportunities to be creative. Just keep this avenue always open. We should ask ourselves every time we are in the classroom, "does the student have the opportunity to be creative in my class?"